Villány – producing excellent Mediterranean style red wines is located in the Southwest of Hungary, west of the river Duna. A couple of years ago Villány introduced its own appellation control sytem, DHC or Districtus Hungaricus Controllatus which symbolises the region’s strong commitment to high quality standards. Since then the “crocus” has become the symbol of top Villányi wines. 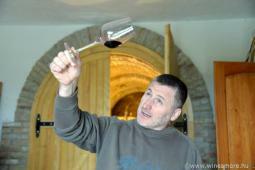 Not only strong commitment to quality, but utmost respect of traditions features the winemakers of Villány. There are numerous old wine cellars, cellar villages in the wine region, like the ones in Palkonya, Villánykövesd or Nagyharsány. Our guests are warmly welcome in these cellars for wine tasting. Villány has a sub-mediterranen climate, with a lot of sunshine, early ripening season along with hot summers, long, warm autumns and mild winters. 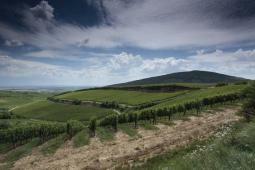 The sheltering effect of the Villány Mountain also contributes to the ideal conditions besides the diverse terroir. Sandy loess topsoils cover dolomite, marl and limestone. Terroir enhances the differences of the vineyards for their aroma and flavour characters, like in Burgundy. Villany produces predominantly red wines, but some nice whites of Olaszrizling, Hárslevelű and Királyleányka have also appeared in the market recently. The wines are among the highly rated ones throughout the country, appreciated both by wine professionals and “average”consumers. The Cabernets and Merlot are blended here with Syrah, Pinot Noir or the local Kadarka and Kékfrankos (Blaufrankisch) which is quite exceptional. Lately Cabernet Franc has become a favourite grape among most of the winemakers. 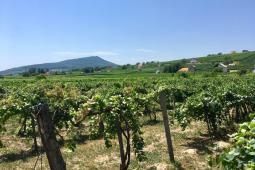 Gentle hills, sunshine, rosé wine, Kadarka, Bikavér, Mediterranean atmosphere, neat vineyards characterise the Szekszárd wine region. The area is located at the western edge of the Alföld (Great Hungarian Plain) in southern Hungary and produces fragrant, well-structured red wines, mostly from Kekfrankos, Kadarka, and the Bordeaux varieties Cabernet Sauvignon, Cabernet Franc and Merlot. White wines are also produced here around Bátaszék, most often from Olaszrizling, Tramini and Chardonnay. The symbol of the city a sarcophagus confirms the fact, that Roman settlers cultivated vines around Alisca (Szekszárd) in the 3rd century. Emperor Probus was famous for his devotion for wine and established vineyards throughout Pannonia. (Western part of today’s Hungary). Later in the 18th century German farmers brought their discipline and sophisticated viticulture. Today’s winemakers are proud of their traditions and appreciate the winemaking heritage of the region. Vida, Takler, Dúzsi or Heimann are all emblematic individuals of Szekszárd and are devoted to make wines of excellent quality.